Southern Illinois University Edwardsville will welcome students to campus for fall 2016 with events beginning Thursday, Aug. 18. Thousands of students, including 1,950 freshmen, will enjoy activities prior to the first day of classes, which begin Monday, Aug. 22, and afterwards. 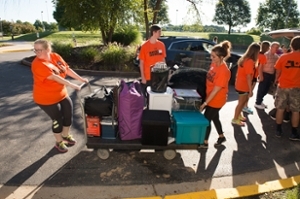 University Housing’s Move-In Day will be from 8 a.m.-4 p.m. Thursday at Bluff, Prairie and Woodland residence halls. Move-In crews will help students and their families unload and transport their items into residence hall rooms. A convocation for new SIUE students will be held at noon Friday, Aug. 19 in the Vadalabene Center. The official welcome to the University community comes complete with music, videos, SIUE selfies and a social media challenge. SIUE’s fifth annual Cougar Kick-Off is planned later from 6-10 p.m. Friday in the Korte Stadium. Students will enjoy this SIUE spirit event that will feature games, contests in the stands, pictures with Eddie the Cougar and more. Move-In Day, New Student Convocation and the fifth annual Cougar Kick-Off are all part of The SIUE Experience that runs from Thursday-Sunday, Aug. 18-21. Faculty, staff and student volunteers will continue to welcome students in the days to come with providing on-the-spot information through the new program, Ask Me! Volunteers will be staged throughout the campus on the first day of classes, Monday, Aug. 22, to answer any questions students may have. For information about a few other SIUE’s welcoming events, visit Cougar Welcome 2016: Departmental Resource Fair, Cougar Welcome 2016: Merchant’s Fair, Cougar Welcome 2016: Rocky Horror Picture Show and Cougar Welcome 2016: Student Organizations Activities Fair. Shown are volunteers helping students at the 2015 Move-In Day at SIUE. 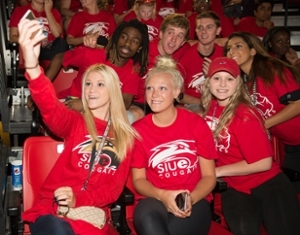 Freshmen take time to pose for an “SIUE Selfie” at the 2015 Convocation.